Disney is currently getting their live-action Lion King movie ready, and casting is underway. It looks like director Jon Favreau will be bringing at least a couple of the old voice actors back, but there is definitely some new talent coming on board. If he gets his way, some of that new talent will come in the form of Grammy-award winning artist Beyonce. 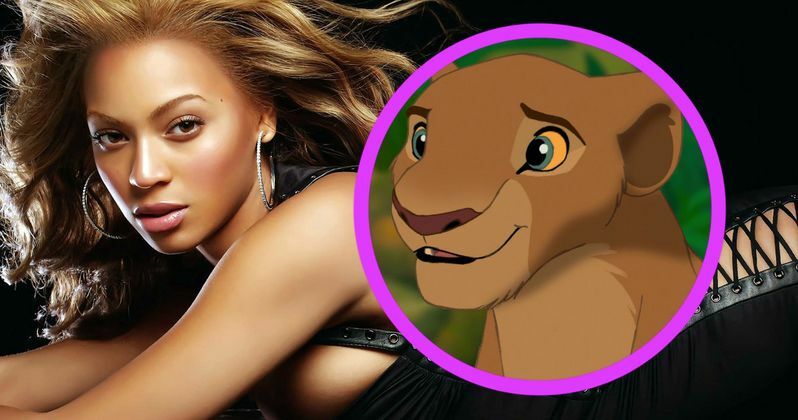 According to Variety, Beyonce is director Jon Favreau's top choice to play the role of Nala in this reimagining of The Lion King. The report notes that she hasn't made any kind of decision about the movie yet and, since she's pregnant with twins, she is taking her time. Disney and Favreau want her to play the role and since it is a voice-acting role, they will reportedly be doing anything they can do in order to accommodate her schedule. Not that Disney is going to need any help getting people excited about this remake of The Lion King, but getting someone as talented and well-liked as Beyonce on board will definitely help. There hasn't been a whole lot in the way of casting announcements so far, but it was recently announced that Donald Glover, aka Childish Gambino, is going to be the new voice of Simba. It was also announced that James Earl Jones will be returning to provide the voice of Mufasa, which he did in the original 1994 animated classic. Given the relationship between Nala and Simba, at least in the original movie, the chemistry between those actors will be important. We can't speak to that, but it is interesting that Jon Favreau is going after actors that have proven themselves as actors and singers. The Lion King is most definitely a musical and having people who can really sing will help. According to Disney, this new "reimagining" as they call it, will utilize the same technology that was used to bring the animals and environments to life in The Jungle Book. Since Jon Favreau directed The Jungle Book, it makes sense that they brought him on board to do this remake of The Lion King. Disney and Jon Favreau are also still reportedly working on a sequel to The Jungle Book, which also makes sense, given that movie's success at the box office. As far as we know, there won't be any human characters added to the narrative of The Lion King, which is probably why Disney isn't calling this a live-action remake. All of the environments and animals in The Jungle Book were CGI and, since that is going to be their approach to this new version of The Lion King, it may not be technically correct to call it a live-action remake. Disney has been having a tremendous amount of success in remaking their animated classics in live-action lately. Movies like Alice in Wonderland, Cinderella, The Jungle Book and now Beauty and the Beast have all crushed at the box office. That, coupled with the fact that The Lion King remains one of the most successful animated movies ever made, having grossed $968 million back in 1994 on a budget of just $45 million, should give Disney every shred of confidence that this remake will be a big moneymaker. Also, everything Beyonce touches seems to turn to gold, so having her magic touch would probably help.